An avid surfer and swimmer who grew up in Imperial Beach, California, he has fond childhood memories of helping to preserve the Tijuana Estuary as a National Wildlife Refuge. As a teenager, he learned to surf in Imperial Beach, which led to thrilling surfing trips in Baja. These marine adventures eventually morphed into a doctoral dissertation on gray whale conservation in Mexico. Today he is Mayor of Imperial Beach and Executive Director and co-founder of WILDCOAST/COSTASALVAjE, an international grassroots organization dedicated to protecting some of the most beautiful and biologically significant coastal and marine ecosystem areas in southern California and Latin America. Over the past 15 years under Serge’s leadership, WILDCOAST has become a leading marine conservation authority on southern California and Baja coastal ecosystems—preserving more than three million acres of the peninsula's most beautiful and wild beaches, islands, and lagoons along the shared coastline. WILDCOAST is working with the California Department of Fish and Wildlife, partner agencies, and volunteers to conserve San Diego County’s eleven marine protected areas through outreach, education and monitoring. WILDCOST is the lead agency of the San Diego County MPA Community Collaborative, a partnership of over 40 agencies, institutions and organizations, responsible for critical components of MPA implementation such as enforcement, monitoring and public engagement. In Baja California WILDCOAST has helped to protect 33,367 acres and 36.7 miles of coastline in the Valle de los Cirios, one of the largest private coastal protected areas in North America. Wildcoast is also working to conserve the threatened coral reef of Huatulco National Park. Working in coastal Oaxaca requires a commitment to working in partnership with indigenous communities, which are essential for conservation success. 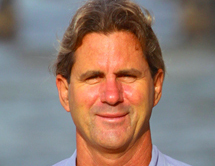 Before Co-founding WILDCOAST, Serge was the former founding director of The Nature Conservancy’s Baja California-Sea of Cortez Program. He received a Ph.D. in Geography from the University of Texas at Austin, a M.S. in Geography from the University of Wisconsin-Madison, and a B.A. in Political Science from the University of California, San Diego. Serge is the author of Saving the Gray Whale, a book based on the three years he lived in the gray whale lagoons of Baja California, Wild Sea: Eco-Wars and Surf Stories from the Coast of the Californias, and Surfing the Border.